We do not see it, but we feel it as soon as we enter a room. Good energy (or “Chi”) is essential for a harmonious life where things go well and dreams can come true. Let the energy flow freely in your home. Don’t let it stagnate. Open the windows every morning, especially in the bedrooms, to allow fresh energy to enter. is about this energy. It is not about re-arranging your furniture (at least not at this stage). It is about optimizing the energy flow in your home, which in turn influences many aspects of your life. According to the ancient Chinese science there are eight types of luck that fill our lives and each is associated with a compass direction. 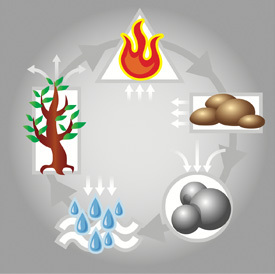 Each of these sectors is also associated with an element (Water, Wood, Fire, Earth, Metal) and once you know the secret of the productive cycle of these elements you can enhance each area as you wish. If you want to apply Feng Shui successfully though, you should not focus on your wealth and prosperity sector only (natural though this may seem). Instead, it is more important to identify the problem areas which are often the major cause for any difficulties you might be facing. Remember that all areas need to be in sync to create positive energy and thereby good Feng Shui. Good Feng Shui can help you advance in your career, it can help you or your children achieve good exam results, or bring you the love of your life if this is what you are looking for. It can also help you clear any obstacles in your life, improve your health, or dissolve quarrels, thereby paving your path for increased wealth, health and happiness. But there is a lot more to Feng Shui than just that. Feng Shui also applies to people, providing a formula to calculate their good and bad directions. Each person has four good (auspicious) and four bad (inauspicious) directions, depending on his/her date of birth. So to achieve the best possible results people should be aware of how to use their best directions. This is where re-arranging of furniture comes into play and might be advisable. Another important element of Feng Shui is the time dimension. Feng Shui is not static, you do not “feng shui” your house once and then you are done. The energies change constantly, just like the stars in the sky change their position every night. This is called “Flying Stars” Feng Shui, and each house has its own Flying Stars chart depending on its age and facing direction. With Flying Stars Feng Shui you can determine the lucky sectors of your home and uncover your biggest wealth potential! There are also very powerful annual flying stars, so called because they change their position every year, and it is therefore important to update your Feng Shui annually. “There is magic in this world but you must know how to use it.